Hi everybody, I am Maciek, marketing and sales trainee at Visuality. I’m a huge sneaker fan, or if you prefer - a sneakerhead. Been “in the business” for three years now and I don’t even think about quitting. But hold on for a minute, do you even know what the word “sneakers” means? We Google it aaaaaaand here it is! I thought that it is a frequent topic nowadays and everybody must have heard about the hype. A couple of days ago, we received an unusual inquiry about building a tool which will support buying shoes that come out in limited series. It occurred to me that no one in my team knew about such popular sneakers and how difficult is to buy them. That’s why I decided to dig more into the topic and describe it in a few words. a drop- release of the shoe in store or online. to camp out - waiting in the queue in the store, sometimes for a few days. hype - A fad. A clever marketing strategy which a product is advertised as the thing everyone must have, to the point where people begin to feel they need to consume it. Yeezy - a special line of shoes and clothes created by a famous rapper Kanye West in cooperation with Adidas. The name was taken from Kanye’s nickname. Two weeks ago the name Kanye West was on every shoe and fashion lovers lips...again. 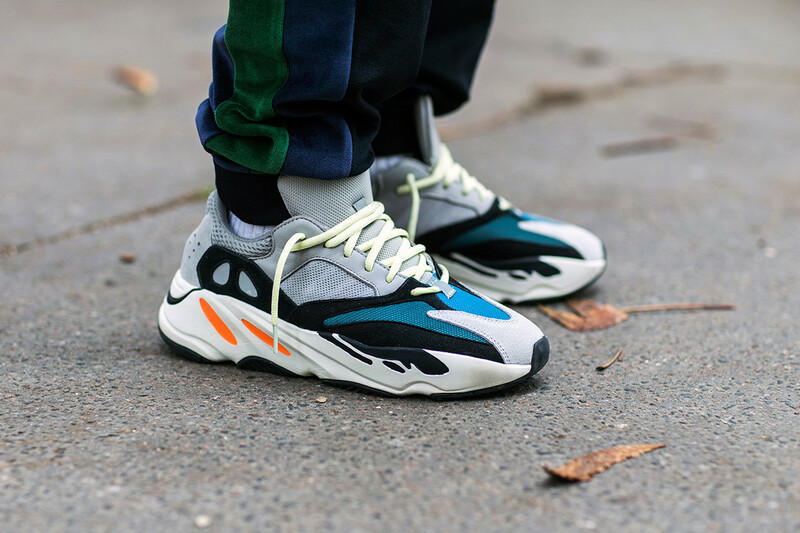 On Saturday 15th of September there was a worldwide release, actually re-release of the Adidas shoe in collaboration with West. Very low quantities in the drop (circa 19k pairs in Europe), many people willing to buy them, all this creates extreme hype. The shoe fits perfectly into the current fashion trends. Their cut is very modern, but it reminds of “your dad’s shoe” style, offered nowadays by other sneaker brands and boutiques such as Balenciaga or Gucci. All mentioned above caused that the sneakers were sold out instantly in every store which had exclusive access to them. Queues, raffles, camping out in front of the stores - just a regular day for all the sneakerheads worldwide, during a Yeezy drop. Shoes were also available on Adidas.com. And here is where technology and web solutions meet with supply and demand. Another proof that modern retail selling cannot survive without tech that facilitates life for both sides - vendors and buyers. Adidas created a mechanism on their site which juggles with IP addresses, and after checking that you are not a bot, allows you to buy the shoes you want. Everything just to give everybody equal chances. Of course, you need some luck too, like in pretty much everything in life. What does this “mechanism” mean for the user? Waiting in front of your computer, mobile phone, tablet screen for a long time to be redirected on another page, where you can choose your size and pay for the shoes. 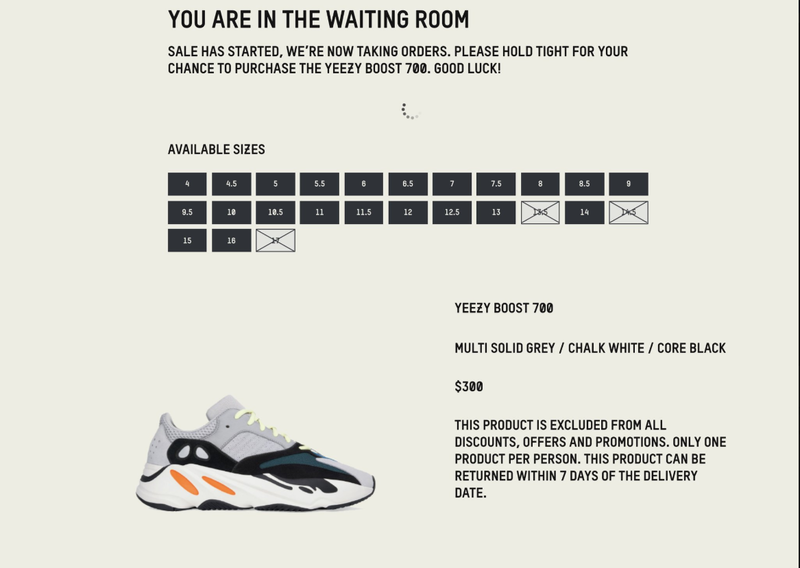 This concept of waiting in the “queue” for many hours to get your beloved sneakers is drumming up the business, makes the whole experience more exciting and boosts the hype even more. People love what they cannot get, so the aura of the exclusiveness rises the demand and affects the value of the product itself. One of the technological reasons for that is to prevent the buying bots from buying large quantities of shoes. People that stand behind such actions do it for their financial benefit. It’s simple, such rare shoes immediately gain more value, and they can be sold on the aftermarket for a lot more than they originally cost. These hackers or so-called “scalpers” did a business out of sneakers, concert tickets, collectibles, etc. and are a big threat to the business. You may think “But the vendor gets the money, so what’s the problem”. It much more than the money, it’s the reputation of the brand. You may be annoyed when you are constantly asked if you’re a bot through captchas and other tools, but it’s the reality. Shoe vendors hide such hack proof mechanisms behind so-called “splash page” which to a user looks like a refreshing website or a frozen OS with a message on it. Saturday’s release on Adidas lasted circa 3 hours, and after that, every pair was sold out. During that time we can see which sizes are still available as on a screen below. Of course, after the release, prices on the aftermarket are changing. Retail price for the shoe was 300 USD. Current market price is something between 400-450 USD . Of course, all depends on the size. If you like the shoes and want to buy them, do it now because the price will go up very fast. I tried to teach you some basics connected with sneaker releases. We could witness a great mix of the almighty law of supply and demand mixed with marketing and technology in there. The tech took it to the whole new level which drives a lot of people crazy but increases the demand even more. Way to sell your products, don't you think? What is your opinion about this phenomenon? Have such problems with bots and “scalpers” ever occurred to you? Let us know if you need help in protecting your app and fighting the bots. PS If you would like to see more about sneakers, check my Instagram! Why we chose Ruby on Rails and React.js for our main technologies? (FAQ). The choice was not easy but we know that it was a good one. Read my article to see what great technologies help us in building high-quality apps for you. A little bit of history and tech research in plain English will help understand what programming was and what it has become nowadays.